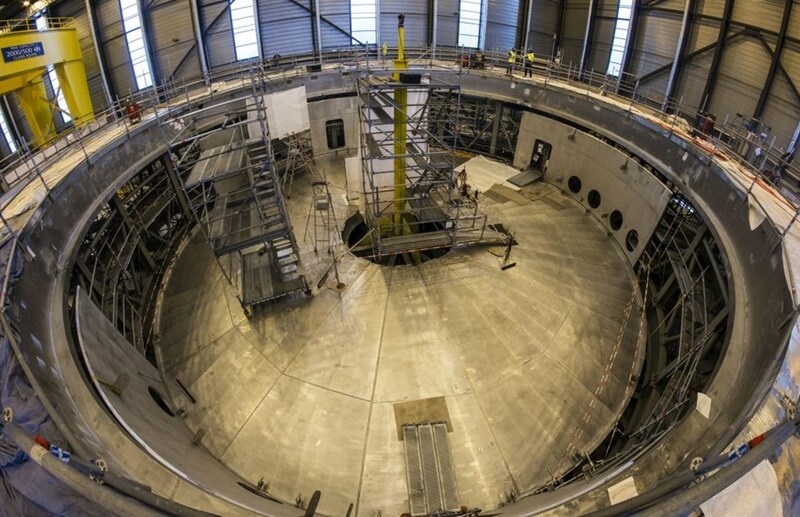 Just over two years after the first welding activities were initiated in the Cryostat Workshop at ITER, Indian Domestic Agency contractors are executing the final assembly tasks on the two lower sections of the cryostat—the base and the lower cylinder. Site acceptance tests are planned in March/April. 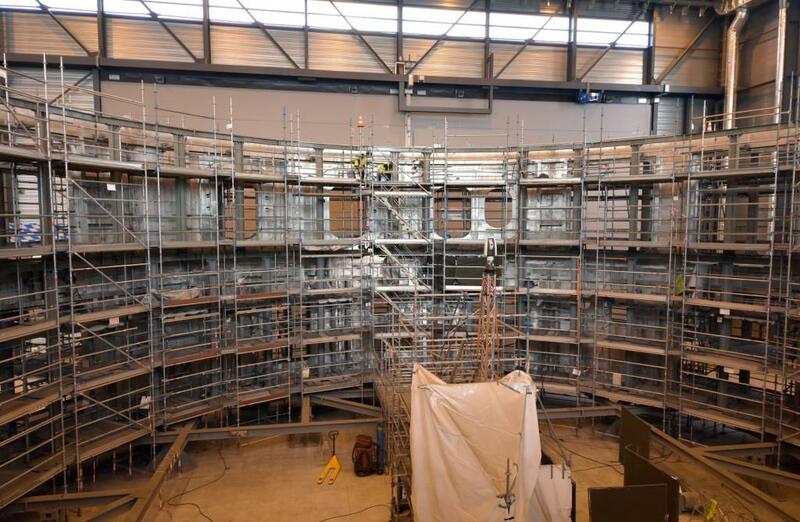 On large steel frames at either end of the Cryostat Workshop ITER's largest component—and the world's largest stainless steel high-vacuum pressure chamber—is taking shape. 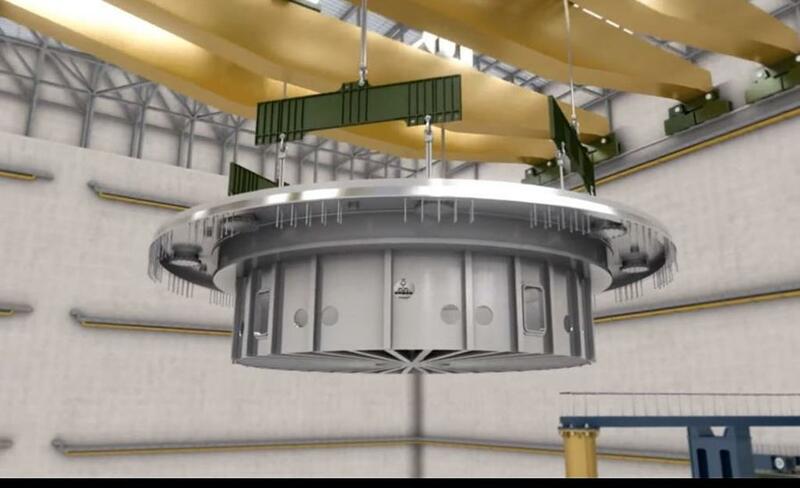 The 29 x 29 metre cryostat has two important functions in the ITER machine: it provides a vacuum environment to critical "cold" components (the magnets operating at 4.5 K and thermal shield operating at 80 K); and it has a structural role in supporting the mass of the Tokamak and transferring horizontal and rotational forces to the radial walls. 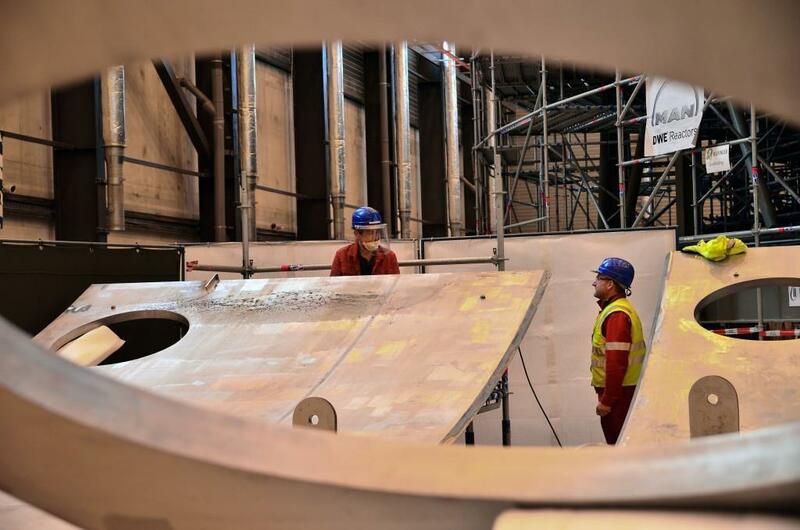 The assembly of the cryostat has been underway since September 2016, when teams of welding specialists began assembling the pie-slice-shaped segments of tier one of the base. Work began in 2017 on the lower cylinder and today, the fabrication of both lower sections has advanced to the final activity stage under Indian contractor Larsen & Toubro (manufacturing design, fabrication and assembly) and sub-contractor MAN Energy Solutions (welding). 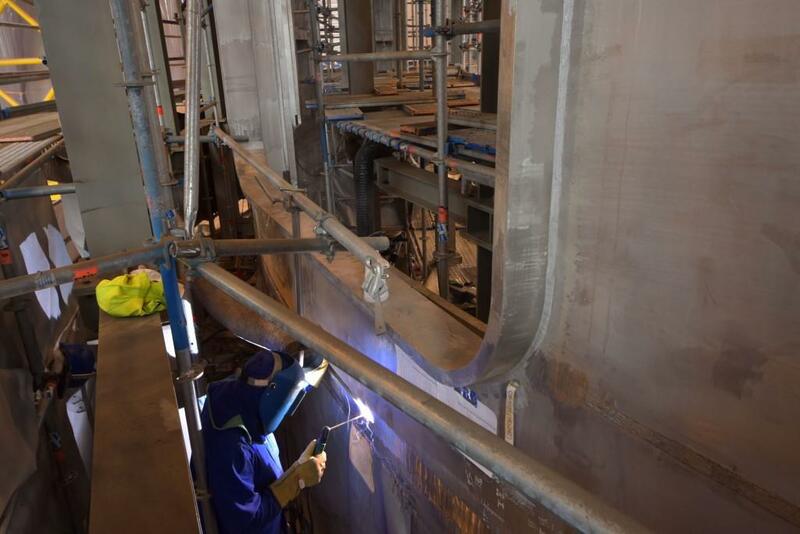 The last seam welds are underway now on the lower cylinder, while the three parts of the base—lower sandwich, upper pedestal, and vertical shells—have been aligned for final welding and assembly. See more detail in the gallery below. The team in the Cryostat Workshop is now fitting and aligning the six side shells of the base on the completed bottom sandwich structure. 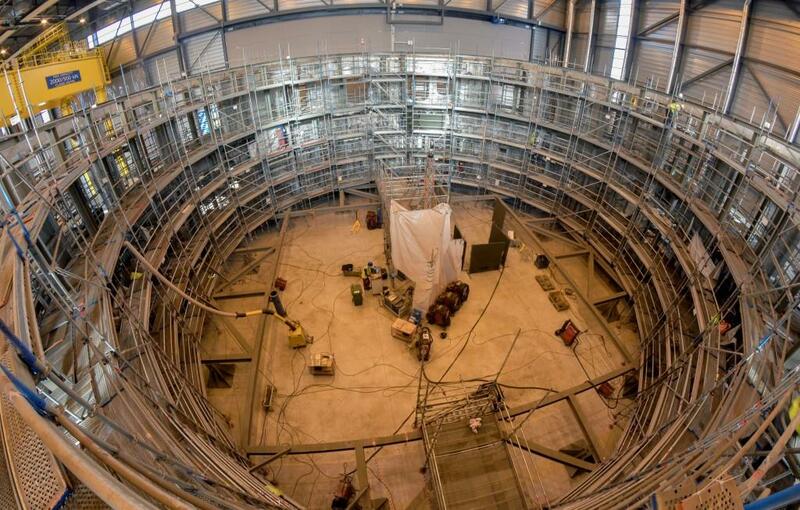 Up above is the thick pedestal ring—the part of the cryostat base that will be supported by the concrete crown in the Tokamak Pit, and that will in turn support the upper sections of the cryostat. 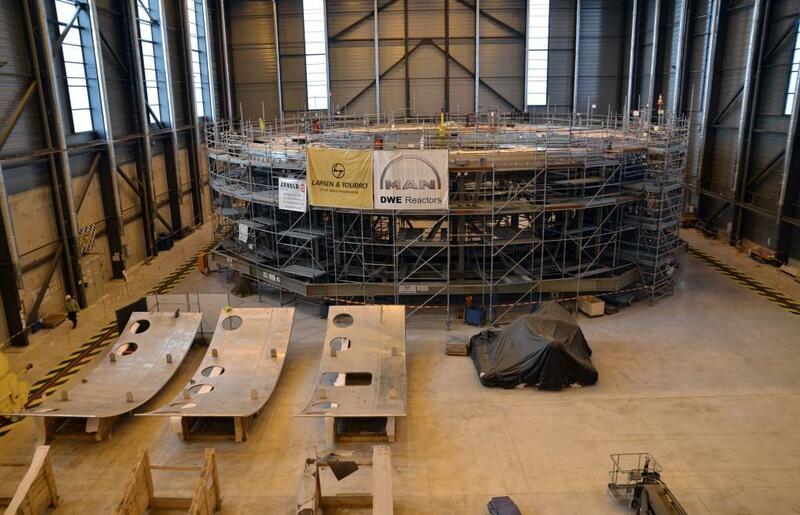 The completed cryostat base will weigh 1,250 tonnes—the heaviest single component to be lowered by the overhead cranes into the machine assembly well in the Tokamak Building. 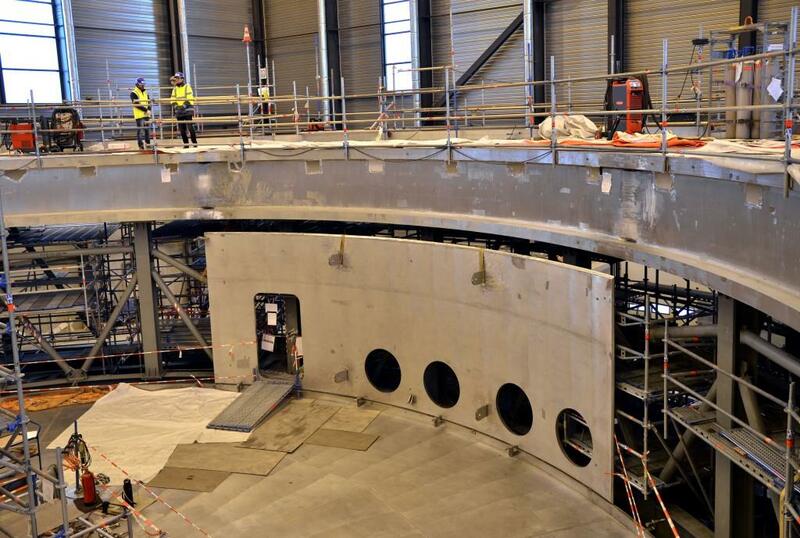 This operation will be the first major lift of ITER assembly in March 2020.